Tagline A secret experiment. A deadly virus. A fatal mistake. Resident Evil is a 2002 German-British science fiction action horror film written and directed by Paul W. S. Anderson and produced by Bernd Eichinger and Jeremy Bolt. The film stars Milla Jovovich and Michelle Rodriguez. It is the first installment in the Resident Evil film series, which is loosely based on the Capcom survival horror video game series of same name. Alongside Jovovich and Rodriguez, it also stars Eric Mabius, James Purefoy, Martin Crewes, and Colin Salmon. Borrowing elements from the video games Resident Evil and Resident Evil 2, the film follows amnesiac heroine Alice and a band of Umbrella Corporation commandos as they attempt to contain the outbreak of the T-virus at a secret underground facility. The film received mixed reviews from critics but some highly praised Jovovich and the cast performances as well as the action sequences and the zombies design. It was a box office success, grossing more than $100 million worldwide. Alice awakens naked in the bathroom of a deserted mansion with amnesia. She dresses, checks the mansion, and is subdued by an unknown person. A group of Sanitation Team commandos led by James Shade breaks into the mansion and arrests Matt Addison, who just transferred as a cop in Raccoon P.D. The group travels to the underground train under the mansion that leads to the Hive, where they find Spence. The commandos explain that everyone in the group except Matt is an employee of the Umbrella Corporation, and Alice and her partner Spence are security guards for a Hive entrance under the disguise of a couple living in the mansion. Five hours prior, the Red Queen had shut down the entire facility and released a gas which killed everyone inside, flooded the labs, and destroyed the elevators, also causing Spence and Alice's amnesia. At the Queen's chamber, a laser defense system kills Shade and three more commandos. Despite the Red Queen's urgent pleas for the group to leave, Kaplan disables the Red Queen systems, and the power fails, opening all of the doors in the Hive. This releases the zombified staff and containment units containing Lickers. When everyone regroups, they are ambushed by a horde of zombies and a gunfight ensues. J.D. perishes as the group becomes overwhelmed. A bitten Rain retreats with Kaplan and Spence; Matt becomes separated from Alice, who starts regaining her memories. Matt looks for information about his sister Lisa and finds her zombified. Alice saves him, and Matt explains he and Lisa were environmental activists, and Lisa infiltrated Umbrella to smuggle out the evidence of illegal experiments. Alice remembers she was Lisa's contact in the Hive but does not tell Matt. The survivors reunite at the Queen's chamber, and the commandos explain they have one hour before the Hive traps them inside automatically. Alice and Kaplan activate the Red Queen to find an exit. To force her cooperation, they rig a remote shutdown. As they escape through maintenance tunnels, zombies ambush them, and a reanimated J.D. bites Rain before getting killed. The group reaches safety, but Kaplan is bitten and separated. Alice remembers that an anti-virus is in the lab, but they find it missing. Spence remembers he stole and released the virus. He hid the T-virus and anti-virus on the train. Spence is bitten by a zombie, which he kills before trapping the survivors in the lab. He retrieves the anti-virus, but is ambushed and killed by a Licker. The Red Queen offers to spare Alice and Matt if they kill Rain, whose health is fading and who has been infected too long for the anti-virus to work reliably. As the Licker attempts to reach them, a power outage occurs. The lab door opens to reveal Kaplan forced the Red Queen to open the door. The group heads to the train, where Alice retrieves the T-virus and kills a reanimated Spence before escaping with the others. On the train, they inject Rain and Kaplan with the anti-virus. However, the Licker is hiding on the train and attacks them, clawing Matt and killing Kaplan. In the ensuing battle, Alice subdues the Licker before Matt is attacked by a now-zombified Rain. He shoots Rain dead, causing her head to hit a trapdoor button, opening it and dropping the Licker under the train which ultimately kills it for good. At the mansion, Matt's wound begins mutating. Before Alice can give him the anti-virus, the mansion doors burst open and a group of Umbrella scientists seizes them. They subdue Alice and take Matt away, revealing he is to be put into the Nemesis Program. Some time later, Alice awakens at the Raccoon City Hospital strapped to an examination table, with no memory of what happened since her capture. After escaping, she goes outside to find Raccoon City abandoned and ruined. Alice arms herself with a shotgun from an abandoned police car as the camera pans out. In 1999, Sony and Capcom greenlit a Resident Evil film with George A. Romero signed on as the film's director and screenplay writer. Romero's association with Capcom, the Resident Evil video game series creators, had extended from 1998 when Romero directed an ad campaign for Biohazard 2 (Resident Evil 2) in Japan. Romero stated in an official appearance in Universal Studios' Talk City chatroom that he had his secretary play the entire game through and record the gameplay so he could study it as a resource. Romero's screenplay was based on the first Resident Evil game and included characters from the video games. Chris Redfield and Jill Valentine were the lead characters, involved in a romantic relationship. Barry Burton, Rebecca Chambers, Ada Wong, and Albert Wesker were to also appear. The ending to the film would have been similar to that of the best ending to the first Resident Evil game. Romero's script was disapproved of and production was placed into development hell. Capcom producer Yoshiki Okamoto explained to the editors of Electronic Gaming Monthly that "Romero's script wasn't good, so Romero was fired". In February 2000, Romero revealed in an interview with DGA magazine that "I don't think they were into the spirit of the video game and wanted to make it more of a war movie, something heavier than I thought it should be. So I think they just never liked my script." As Romero's script was a close, but not full, adaptation of the game, Capcom believed fans would feel that the film had been altered too much from the game and that newcomers would dislike the premise. Hired by Sony, Paul W. S. Anderson wrote a screenplay, which was ultimately favored over Romero's. In late 2000, Anderson was announced as director and writer, and Resident Evil re-entered pre-production stages. Anderson stated the film would not include any tie-ins with the video game series as "under-performing movie tie-ins are too common and Resident Evil, of all games, deserved a good celluloid representation". In early 2001, Michelle Rodriguez, James Purefoy and Milla Jovovich were the first of the cast to be signed on the project. David Boreanaz was intended to portray the male cop lead of Matt Addison; however, he turned down the role to continue work on the WB series Angel. Boreanaz suggested that he was in negotiations to have a smaller role in the film, claiming "Resident Evil is still there, a possibility, So, yeah, I'll see what happens", but he later declined the role. The role of Matt Addison then went to Eric Mabius who was cast in March 2001, along with Heike Makatsch, who was cast as Matt Addison's sister Lisa Addison, an employee working for Umbrella's Hive facility. In early March 2001, it was announced that half of the film would be shot in Adlershof Studios in Berlin and its surroundings. Principal photography began on March 5, 2001 at numerous locations including the then unfinished station U-Bahnhof Bundestag of the Berlin U-Bahn, Landsberger Allee, Kaserne Krampnitz and the Schloss Linstedt. The film's score and soundtrack were composed by Clint Mansell, Marco Beltrami and Marilyn Manson during mid-2001. Manson described the score and soundtrack as being more "electronic" than his other previous work. The film was originally subtitled as "Resident Evil: Ground Zero" when the movie was considered a prequel to the games, however the subtitle was removed due to the 9/11 attacks. The film's first plot as of March 16, 2001 revealed that Jovovich's Alice and Rodriguez's Rain were the leaders of a commando team sent in to prevent a viral outbreak from spreading to the rest of the world. The character of the Red Queen was added into the film's story as an homage to HAL 9000 from 2001: A Space Odyssey. 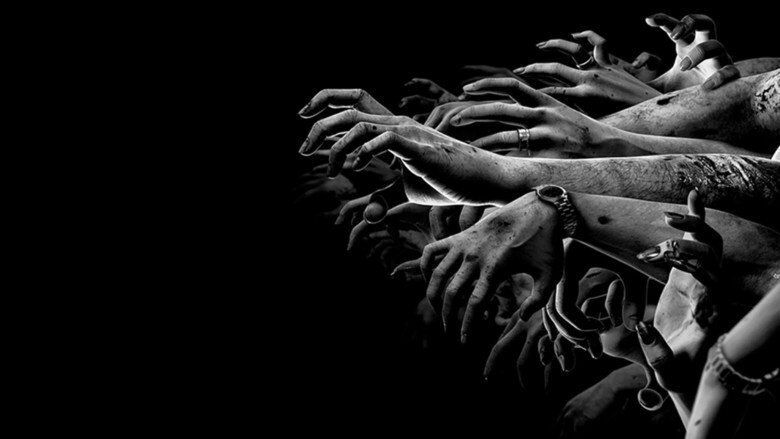 During production, professional dancers were hired to star as zombies as they had better control of their body movements. While computer effects were used on some zombies, much of the undead appearances were accomplished through make-up while their movements were a more laissez-faire approach, as Anderson told the actors to move however they thought a zombie would, given their conditions. Whilst filming, there was a shortage of manpower where the available dancers were not enough to represent the required numbers of undead, however some of Capcom's executives and several of the film producers including Jeremy Bolt agreed to make appearances. The film's stunt coordinator also made an appearance as the dog trainer while Bolt's girlfriend and sister both appeared as zombies. In March 2001, the official website was set up, which revealed the film's original October 26, 2001 release and a redirect to the film's distributor Constantin Films. The website was fully opened in July 2001, and composed of images, plot info, character biographies and downloads. The film was planned to have an R-rated classification which is what Anderson wanted since he knew the film had to be Rated-R in order to capture the horror of the games. In January 2002, the film was officially announced to contain an R rating. In May 2001, it was announced that Sony Pictures Entertainment would distribute the film in North America. It was suggested by Capcom executives that the film would not be released in 2001, but rather in 2002, which was later confirmed by Sony in August 2001. The film was set for release on 5 April 2002 before being pushed forward to a 15 March release. In December 2001, Sony gave fans a chance to design the film's poster with a prize of an undisclosed amount of cash, a free screening of the film, and with the final design being the film's poster. On February 16, 2002, Nick Des Barres, a 23-year-old aspiring actor and ex-video game magazine designer, was announced as the winner of the competition. The film's trailer and clips were released in late January and early February 2002. On June 29, 2004, over two years after the film's release, a novelization by Keith R. A. DeCandido was published. The film opened in 2,528 theaters and grossed $17,707,106 on its opening weekend (March 15–17, 2002). The film grossed $40,119,709 domestically and $102,984,862 worldwide. After commercial success at the box office, a sequel, Resident Evil: Apocalypse (2004) was released. It was followed by Resident Evil: Extinction (2007), Resident Evil: Afterlife (2010), Resident Evil: Retribution (2012) and Resident Evil: The Final Chapter (2016). Anderson did not direct the second or third films due to filming commitments with Alien vs. Predator (2004) and Death Race (2008). Resident Evil received a 34% approval rating on Rotten Tomatoes, based on 124 reviews. Robert K. Elder from the Chicago Tribune stated: the film "updates the zombie genre with an anti-corporate message while still scaring its audience and providing heart-pounding action", while Owen Gleiberman from Entertainment Weekly noted: the film is as "impersonal in its relentlessness as the video-game series that inspired it". Both Resident Evil and the sequel appear on Roger Ebert's most hated films list, published in 2005. In his review, Ebert describes Resident Evil as a zombie movie set in the 21st century, where "large metallic objects make crashing noises just by being looked at", and he criticizes the dialogue for being a series of commands and explanations with no "small talk". The New York Times' Stephen Holden awarded Resident Evil 1.5 stars out of 5 saying that "it has a frantic staccato that is more game-oriented than cinematic". In 2014, filmmaker James Cameron named Resident Evil his biggest guilty pleasure. Various elements are borrowed from numerous video games including Resident Evil 2 and Resident Evil 3: Nemesis, where Alice's character awakes in Raccoon City Hospital with a viral outbreak occurring in the city. There are several references to characters and organizations such as the Umbrella Corporation, the Nemesis program, the underground train bearing the moniker "Alexi-5000" a reference to Code: Veronica's villain Alexia Ashford (the train is from Resident Evil 2, but in the game it reads "Galaxie-5000" instead of "Alexi-5000") and a police cruiser, from which Alice takes out a shotgun, has a "S.T.A.R.S." logo on the hood. Jason Isaacs appears in the film as an uncredited masked surgeon (which is a reference to William Birkin). The character of Dr. Isaacs (played by Iain Glen) in the film's sequels is dedicated to or based on him. Other references to the first game include Alice examining the mansion by going outside; crows are visible for a moment. Crows are minor enemies that the player encounters throughout each game. Alice finds a picture of her wedding day with Spence, which is the same style as the photos in the first version of the Resident Evil game: in black and white with the foreground image noticeably spliced onto the background. On the newspaper at the end of the film, the words "Horror in Raccoon City! More Victims Dead!" are shown in the upper right corner. This is a reference to the same newspaper in the censored opening of the first Resident Evil game and the prologue chapter for the Resident Evil: The Umbrella Conspiracy novel. Near the beginning of the film, Alice examines a statue after the wind blows its cover off. This statue is similar in design to one in the mansion of the first game. When returning to the Red Queen's chamber, Kaplan points out that the four bodies of the group's dead crew from the Glass Hallway Trap sequence are gone. This is a reference to the games, where the bodies of enemies disappear. When the survivors make their escape from the Hive with a countdown as they fight the final boss, this is a reference to the Resident Evil game which ends with a five-minute countdown, during which the boss must be defeated. A faux newspaper created by Screen Gems for Apocalypse, The Raccoon City Times, indicates hours after the initial outbreak when creatures began appearing in the Arklay Mountains feasting on victims. This is similar to the opening of the first video game. Anderson has stated that the film's camera angles and several shots allude to the video game's camera angles, such as the fight between Alice and the security guard. These include a scene near the beginning where there is a close up of Alice's eye. This is a direct reference to the title screen of the first game. In another scene, Alice awakes and hears a creepy sound, which is a reference to the plot of the first game. Resident Evil was released on VHS and DVD on July 30, 2002 in the United States, April 14, 2003 in the United Kingdom and October 2002 in Australia. It was a special edition release, with a number of documentaries including five featurettes, one of which explained the making of Resident Evil, the film's score composition, costume design, set design, zombie make up tests, and the music video for a remixed version of "My Plague" by Slipknot. A Deluxe Edition was released on September 7, 2004, which included new special features such as an alternate ending with director Anderson's video introduction, a clip compilation for Apocalypse, From Game to Screen featurette, a storyboarding Resident Evil featurette, and 6 other exclusive featurettes: The Creature, The Elevator, The Train, The Laser, Zombie Dogs and Zombies. Screen Gems released Resident Evil: Resurrected Edition, a 2-disc package containing Resident Evil and Resident Evil: Apocalypse, on September 4, 2007. On January 1, 2008, a Blu-ray of the Resident Evil trilogy was released.